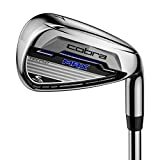 Our best selling iron of the year , the Cobra Max is an easy to use game improvement iron new out for 2016 . The longer clubs have half hollow technology while the 9 and wedge feature a deep undercut and the SW in the set sits like a classic wedge meaning you literally have the best of both worlds. The set is mens right hand fitted with a standard steel shaft and Cobra grip . “NEW 2016” TAYLORMADE PHENOM COMPLETE JUNIOR GOLF SET AGE 5-8 JUST LAUNCHED !!! !